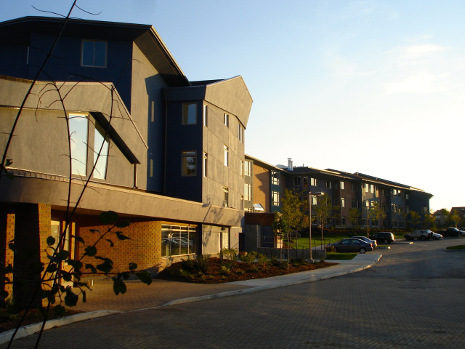 Hesperus Village in Vaughan, Ontario is a seniors’ affordable housing residence offering an independent lifestyle and a rich quality of life. Half of the apartments are rent-geared-to-income units. Located adjacent to the Toronto Waldorf School, Hesperus is surrounded by a protected green space on a wooded ravine along the East Don River. Hesperus residents may choose to enjoy communal meals and many participate in a variety of social, cultural, spiritual, and gardening activities. Hesperus balances the strengths of a strong institutional organization with the nurturing aspects of a caring community. Residents experience the aging process with dignity and grace. Hesperus encourages interaction between the generations, people of diverse cultures, people on various spiritual paths, and those with a variety of interests, skills and talents. Hesperus residents enjoy the security of an on-site medical clinic with three physicians offering both conventional and holistic care. Trained personal support workers are also available as needed. Hesperus founders were inspired by Rudolf Steiner (1861-1925) whose spiritual world view – called Anthroposophy – is reflected in the architecture of the residence building, biodynamic gardening, healthy foods, festival celebrations, and the value of communal life. Iler Campbell LLP is pleased that Hesperus found our firm in 2012, bringing to us a range of questions and issues from how to operate a seniors’ facility in a manner that complies with human rights requirements to government relations questions and commercial real estate transactions. Our relationship, while relatively new, is strengthening as we develop our understanding of Hesperus’ work and the philosophy that underpins it. Visit Hesperus’ website to learn more and see more photos of its facilities.